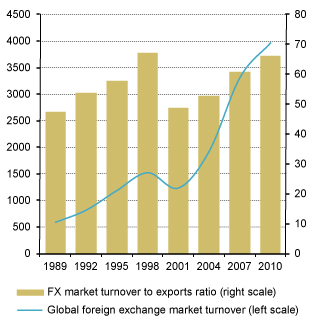 Movements in nominal exchange rates Nominal exchanges rate is the price of one currency in terms of another. that compensate for inflation Inflation is the loss of purchasing power of currency, expressed through a general and lasting increase in prices. moredifferentials and hence keep real effective exchange rates Real effective exchange rates (REERs) take account of price level differences between trading partners. more(REERs) steady over time would also tend to keep international trade balanced and avoid the build-up of unsustainable global imbalances. This is the underlying idea behind the purchasing power parity Purchasing power parity (PPP) is the rate of currency conversion that equalizes the purchasing power of different currencies by eliminating the differences in price levels between countries. more (PPP) theory, which posits that trade imbalances would tend to correct themselves. 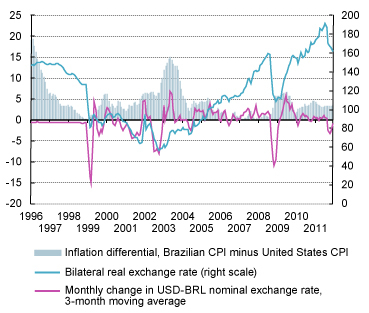 High inflation rates would be associated with an expectation of a compensating currency depreciation, and vice versa. If floating exchange rates were behaving according to this script, they would help support stability in the world economy and avoid tensions between nations. (Average daily turnover in April, $ billions (left scale) and ratio (right scale)) Source: UNCTAD secretariat calculations, based on IMF, DOTS and BIS, Triennial Central Bank Survey Note: Merchandise exports in April are first converted into daily figures for the ratio calculation. . 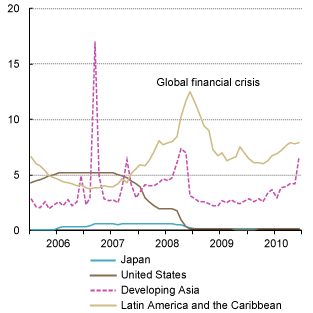 In the absence of proper global governance, global finance has become dominated by herd-like short-term risk-reward calculations that may ignore the gradual build-up of economic imbalances and related financial fragilities for a long time – until a sudden and highly disruptive reversal eventually occurs, adding to the distortions and damage endured during the build-up phase. Especially in currency markets, the world’s largest and most liquid market, financial speculation has proved highly destabilizing. Financial markets are said to be expectations-driven. Given that the future world is inherently uncertain – uncertain in the profound sense of being non-reducible to objective probability calculations – any idea that asset prices may be firmly anchored by fundamentals at uniquely correct values is untenable. The observed restlessness and volatility of financial asset prices is one reflection of this fact. In this context, interest rates Interest rate is the cost or price of borrowing, or the gain from lending, normally expressed as an annual percentage amount. as set by central banks in the conduct of monetary policy provide important fixtures and guidance to financial markets and expectations formation. 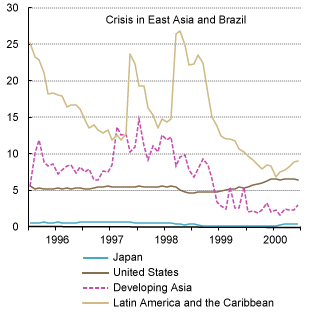 (Percentage) Source: UNCTAD, TDR 2011 (Chart 6.1) Note: Regional interest rate aggregates are PPP-GDP weighted using current PPP weights. . Similar differentials are observed for longer-term interest rates, which are generally less closely associated with national monetary policies than short-term rates. Interest rate differentials invite arbitrage operations, i.e. attempts by actors to profit from price differences across different markets (“buying low, selling high”). There is an incentive to borrow money in a low-interest currency and invest that money in another high-interest currency with the aim of earning the interest differential. Given that different currencies are involved, exchange rates enter the profitability equation of this kind of arbitrage operation. More precisely, what matters are expectations about exchange rate changes over the relevant investment horizon. Traditional (interest rate parity) theory posits that the market determines exchange rates in such a way that high interest rates are compensated for by an expectation of currency depreciation, and vice versa. In this case, there would be no opportunity to profit from interest differentials, and hence no incentive to borrow in a low-interest currency in order to invest the proceeds in a high-interest currency. Neither is this traditional theory borne out by the facts. In practice, high-interest currencies often experience prolonged periods of sharp appreciation spurred by capital inflows. Lured by interest differentials, short-term private capital flows can be highly destabilizing. Currency market carry trade Carry-trade speculation is a strategy whereby an investor sells a currency that yields a relatively low interest rate (i.e. the so-called "funding currency") and uses those funds to purchase short-term assets denominated in a different currency that yields a higher interest rate. speculation is a key driver behind destabilizing exchange rate movements. Borrowing in a low-yield (funding) currency to invest in another high-yield (target) currency tends to move the exchange rate in favour of the high-yield currency. Carry trade speculation feeds on itself as the exchange rate movement thereby augments (rather than subtracts from) the arbitrage profit derived from interest differentials alone. In turn, the attraction of even bigger prospective profit further fuels carry-trade speculation and reinforces the trend as more speculators jump on the band wagon (known as herding). Again, the implication is that REERs may be driven further and further away from fundamental equilibrium values, while competitiveness positions become seriously and lastingly distorted. 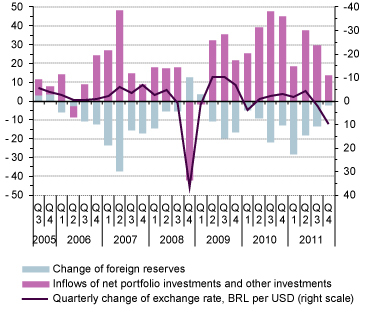 Volatile and unreliable capital inflows do not support but hinder sustained development and catching up. If currency markets are left at their own devices, floating exchange rates neither insulate developing countries from external shocks nor do they guarantee sufficient policy space. Financial globalization implies a de facto loss of national policy autonomy. 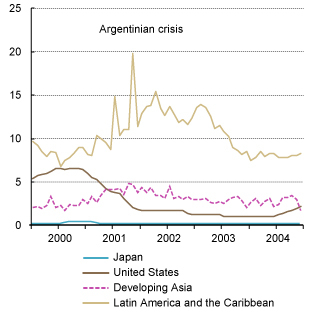 External financial conditions largely determine the scope for development strategies and domestic macroeconomic policies. Highlighting existing asymmetries in the world economy, these conditions are influenced mainly by monetary policy decisions taken in the key developed countries. Note: A negative value of reserves means an increase in reserves (capital outflow). A positive value of the exchange rate change represents a depreciation of the currency. The authorities of target currencies in the developing world are facing difficult choices. If floods of private capital inflows fuel asset prices and inflation expectations, hiking interest rates amounts to adding fuel to the flames. So the widely preferred policy choice features currency market intervention and reserve accumulation to stem the appreciation wind. The net effect of this response is that reserve accumulation offsets net private capital inflows in target countries' international investment positions. This may even be costly for the recipient country of hot money as the authorities effectively act as counterpart to the private carry trade. Capital controls to block undesirable short-term capital inflows provide an alternative unilateral measure. Re-regulation of global finance and the establishment of a multilateral international monetary order remain the order of the day. Re-regulating global finance and establishing a multilateral international monetary order are needed for global stability.